The title of Keith’s blog post, Cuban Pewee: Nature’s Least Scary Tyrant, made me wonder why the New World Flycatchers’ family is called Tyrannidae. 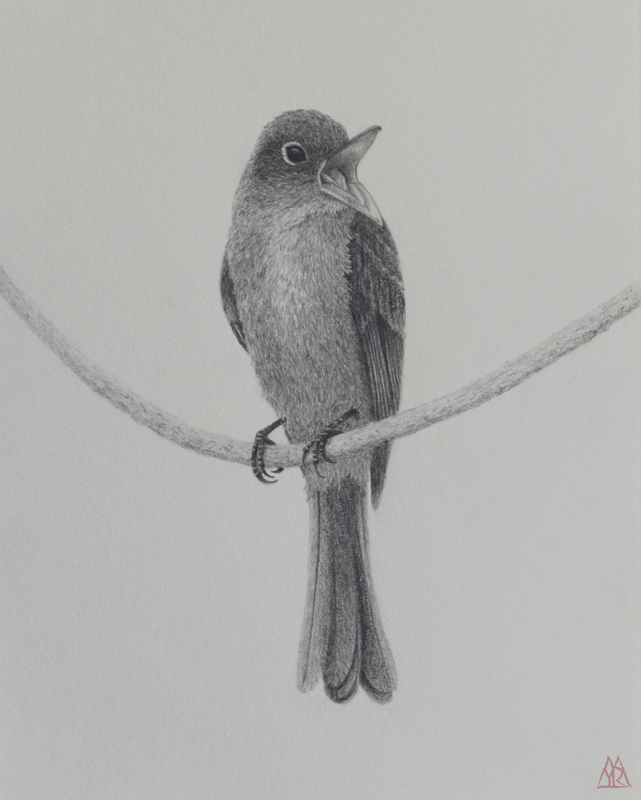 Why oh why is the sweet-looking Cuban Pewee a tyrant flycatcher? 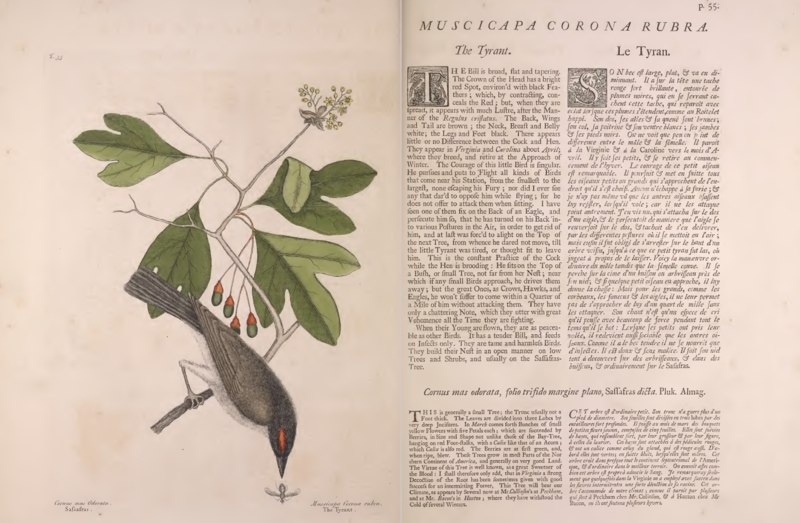 The best Google Search clue was a broken link to a 2014 Birdwatching article by Kenn Kaufman in which he attributes the name “tyrant” to Mark Catesby. 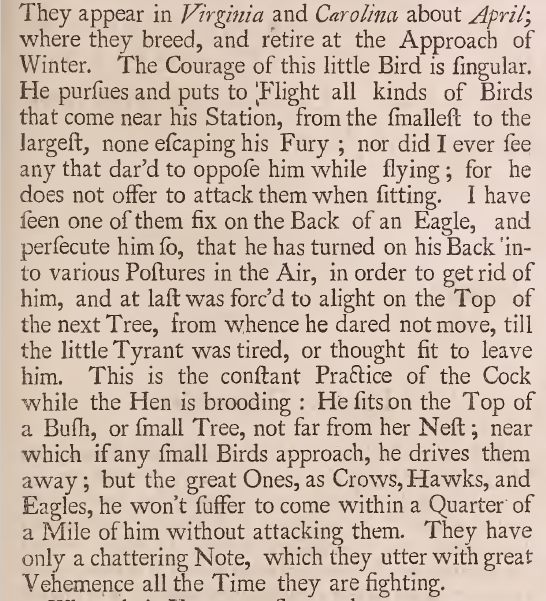 More reliably, An Inquiry into the History of the Current English Names of North American Land Birds (Spencer Trotter, The Auk, 1909), links the name “tyrant” with Catesby. The male Eastern Kingbird is a courageous and aggressive defender of his territory and his offspring! From 1731, I slowly travelled forward in time, following the progress of the name tyrant from species name, to genus name and finally to family name. The official start of modern zoological binomial nomenclature was in 1758 with the 10th edition of Carl Linnaeus’ Systema Naturae. Linnaeus’ gave the Eastern Kingbird the Latin name Lanius tyrannus. Thanks :-). Let me know if there is anything you would like to change about my references to you and your photos. Great renditions, Myriam! Interesting read too. Glad you noted that the small s looks like an f. It looked a bit awkward at first. Happy Draw A Bird Day! Thanks, Carol :-). I’m happy you enjoyed this post. I think that was the oldest book I ever looked at. It was tricky to read at first, but I had fun once I got the hang of it. Happy Draw A Bird Day! I’m looking forward to your next bird!!! Thanks, Charlie :-). I’m happy you enjoyed this post. Happy Draw a Bird Day! Your bird Doodlewashes are wonderful! Thanks my friend! 😃💕 Yeah, birds are now one of my favorites to sketch thanks to our community. So much fun! I love the tyrants I have encountered, the Cuban Pewee not being one of them. The second one does look like a jolly, mischievous fellow :-). Thanks for sharing your observations. I like finding out what catches people’s eyes in my drawings. I’m not very familiar with flycatchers. I’ve mostly caught glimpses of them during migration. 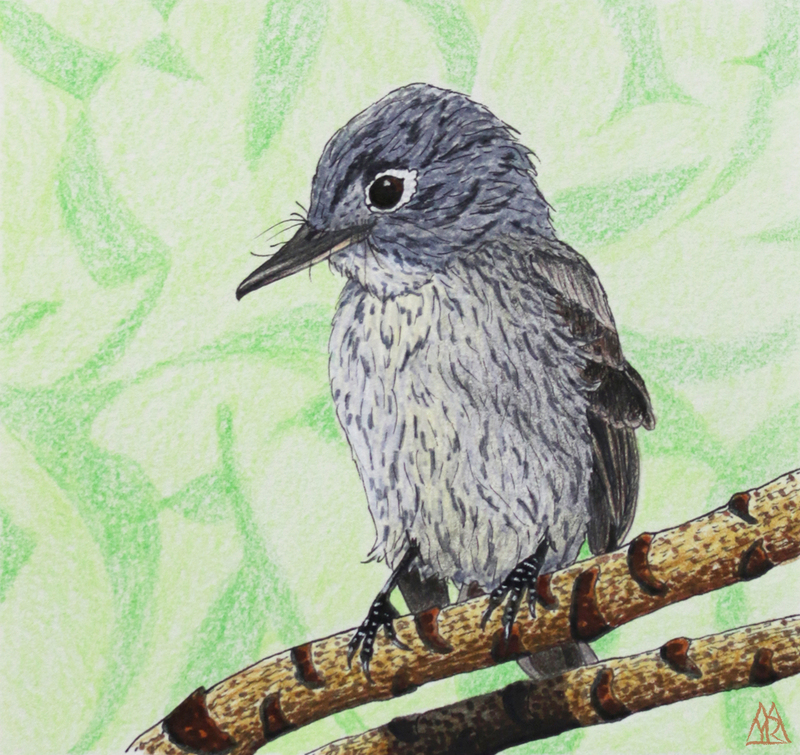 I did get to hear an Alder Flycatcher sing late last spring, which I was super excited about. I even played its song, something I hadn’t done before. He responded by flying out of hiding, looking quite excited. He perched near me and burst into song! Which flycatchers are familiar to you? Your second drawing is magnificent! I love the mouth and eye too. Thanks, Deborah :-). I’m happy that you enjoyed the drawings and the historical excursion. Have a great day!